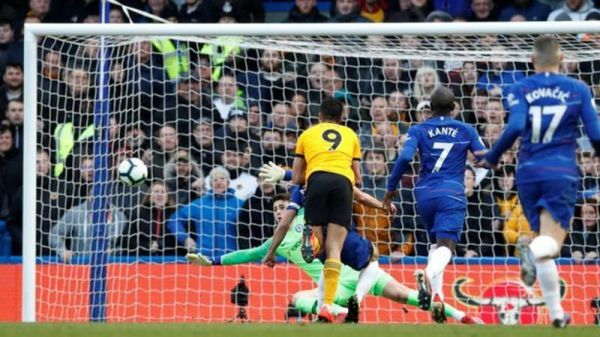 Eden Hazard scored a stoppage-time equaliser to rescue a point for Chelsea against Wolves at Stamford Bridge. Hazard curled into the bottom corner in the second minute of added time to deny Wanderers a memorable victory and ensure Chelsea remain unbeaten in the Premier League since their 6-0 thrashing at Manchester City last month. Raul Jimenez finished off a swift counter-attacking move to put Wanderers ahead with their only shot on target nine minutes into the second half. That looked to be enough, particularly when substitute Willian saw his curling effort well saved by Rui Patricio late on, but Hazard struck to salvage a draw with his 16th goal of the season. Despite only managing two attempts on goal all game, Wolves may feel aggrieved at only securing a point having defended diligently, restricting Chelsea to half-chances and efforts from distance. Chelsea only had one shot on target during the first half, an effort from Gonzalo Higuain from a tight angle that was comfortably pushed behind by Patricio. Maurizio Sarri's side improved after going behind, with Pedro having a shot tipped over before Higuain failed to convert when the ball flashed across the box following a corner. It was hard to see Chelsea scoring as the game entered added time but Hazard showed neat skill to turn away from Ruben Neves and finally beat Patricio from 18 yards.